I thought, "what better time to splash on some "Eau De Alice In Wonderland"....than now....I think the real movie (Tim Burton style), comes out March 5th! these were some of my favorite looks to do....I hope you enjoy! So here we go....may you have a delightful day....and if it feels overwhelming....upside down, chaotic, sad, maddening....may you think of the Wonderland.....there is wonder all around us....we just need to put on our "wonder-eyes" to see it!!! ive just done a alice in wonderland themed post on my blog. I love the makeup... it looks awesome! Kandee you are so inspiring- with everything going on in your life you still manage to find the silver lining in the world and focus on that. You inspire people daily, between your make-up and your uplifting outlook on life I find it hard to believe how some people could still be so mean hearted toward you. You are an amazing person Kandee don't let anyone get you down you are only as strong as you want to be and you are a true testimony to that. Thank you for everything Kandee I honestly hope everything looks up for you and you are your family get through this. Oh, such a niece piece of story from your mind.. I can cry right now, how beautiful it is. 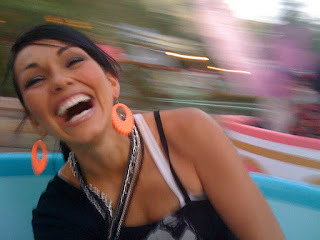 Love you, Kandee. have you ever tried http://www.bitchslap-cosmetics.com/ ? they have some awesome colors!!! You did such a great job with both os these looks. You inspire me every day. i love how "copy" the looks, but make them even better with your own little spin on them! thanks for posting such great stuff. I really loved these two looks you did when portraying Mad Hatter and the Queen of Hearts! Oh and I wish I were able to go to Disneyland but unfortunately we don't have this magical place in Romania...It seems to be perfect and amazing! Anyway...thank you again Kandee for making my day great through your wonderful words! I hope you have a marvellous day too and remember to stay strong as you always do! these videos are some of my fav ever- u rock!!!! Kandee! omg girl u crack me up! 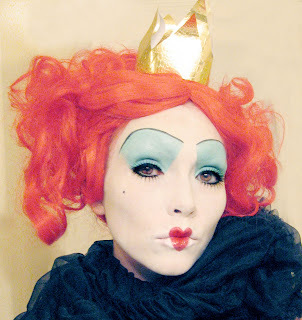 awesome queen of hearts impression! lol "DO u play croooooochet!?" hehe i luv u!! it is a rare occasion when a woman can be as beautiful on the inside as she is on the in! most women who are as gorgeous as u are a little mean! haha! My names Clodagh(: And I am really inspired by the way you are so positive and honest. I really don't know why anyone would have anything bad to say about you and I just want to let you know I give you my support on everything(: I love watching your videos and I hope you keep doing them! You were also asking for requests. I would love to see your favourite look of all time! I done your look that you done on Saori for a party thong I went to recently and it was a big hit!! Thanks for all your kind motivating words you speak in all you videos! I'm only 14 but I still feel like I can associate with all you do! Keep up the amazing work!! These 2 looks are amazing...I had seen them a while ago, I love the way u used glue to hide your eyebrows! Looks awasome!!! wonderland rocks! That's where it says I'm from on my FB & myspace profiles... Your BLOG is my daily wonderland! Thanks Kandee! I absolutely love that picture of you on the ride. You just look so happy. Great job on the looks also. I love the teacups!!!! lol I like to make people sick on them! LOL! I am so mean, haha! And the spinning hearts are fun, too! i need to go back to disney! How are you feeling with your back pain? Did they find out what was wrong? love the look! and the integration of the look and your encouraging pick me ups that I always look forward too. Also, this is just a side note. But Brad Guice is a famous Christian photographer who is speaking at my school (Philadelphia Biblical University) this week. He said he hires his own make up artists and prefers to hire Christians. SO, I was thinking, if its okay with you, I'll pass your name and email along to him one day this week. That might cool!?! I love Disneyland. I want to go back so much! I love the teacup ride picture.....so cute!! Hy, lovely photos! You look so happy in them, hope you're always this happy. Your post made me smile, as usual! Can't wait for a new tutorial! Hey Kandee! You're the best! Just watched your new Rihana vid, and thought it was awesome! I don't have much make-up, but I do have turquoise eye liner! Perfect!!! I wish I could go to Disneyland and be under those lights, looking as happy as you. It would be very, lets say " magical! " I love Alice in Wonderland. When I went on the teacups, I rode with her! You are too adorable on the teacup ride! I got the Alice in Wonderland set from Urbany Decay (yay!!!!) so I am looking forward to some things I can do with all these awesome colors! Have a wonderful day! hello beautiful! can you make a video on why your going through a tough time? Your so beautiful and amazing!! You should really remeber that. And the mean people dont know what they are talking about. Dont let it get to you. You have helped so many people! It is just so amazing that you have this way of taking everyone's bad days and just making them disappear. I know personally if I am having a bad day or just bummed out if i read your blog or watch a video it uplifts me and takes all my worries and stress away I love it..Love you Kandee and I hope that you a have a great Vday with the ones you love most!!! Help needed! this is a contest and we can both win some money! Can you help me? Just post a badge on your blog from LuShae Jewelry. Funny you mention thinking about Wonderland when your thoughts might not be the happiest. Yesterday I daydreamed about whimisical places, ruby slippers and emerald cities. Tea parties with colorful petit fours. I hope your day is filled with whimsy and magic and all things fanciful. Hey Kandee! Can you please do a Shania Twain video?The one from Gonna getcha good video?!:)Thanks! 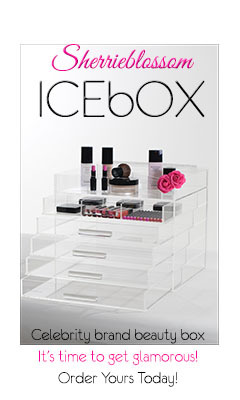 I LOVE, LOVE, LOVE the makeup! Great job! I'm looking forward to seeing that movie!! That was hilarious! Your face was converted in the the cartoon itself. Thanks for sharing. I am in LOVE with the tip on how to cover your eyebrows. YEARS ago I learned to do it with putty and it was a messy hard job. Now I live in a place where I don't even know where to find food coloring!!!! but I have seen glue sticks so THIS is awesome!!!! That was the best day ever! I am so happy that I was lucky to find you <3 you inspire me SO much. Thank God for precious people with wonderful and strong spirits like yourself! I heart you! kandee the make up artist is dominating in Hollywood. The picture looks pretty and hope to see new updates from you soon. I think this look is fabulous. I just stumbled across ur vids a couple days ago, and I'm hooked! You're such a lovely and talented person.....and anyone that tells you otherwise isn't important. Those who mind don't matter and those who matter don't mind. Thanks for all the inspiration!